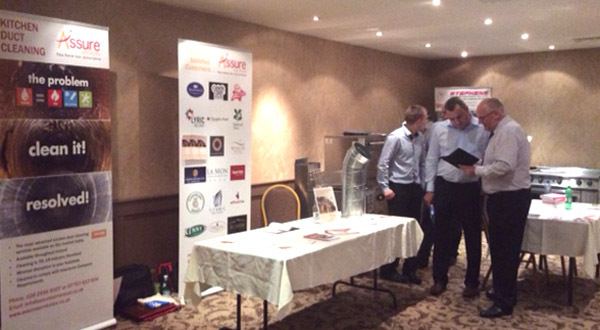 It was time to head North to the Lynas Trade Show held at the end of September for the Assure Services Team and set up in the Lodge Hotel Coleraine. The Lodge Hotel is a 56 bedroom 3 star hotel, situated 5 minutes walk from the bustling shopping town of Coleraine, commonly referred to as the Capital of the Causeway Coast. The hotel is ideally situated in the North Coast of Northern Ireland and the area hosts many celebrated attractions, including the Giant’s Causeway, Mussenden Temple, the Bushmills Distillery, Dunluce Castle and miles of golden beaches. In addition, the North Coast is renowned as a golfer’s paradise, boasting many challenging courses including the famous Royal Portrush. But it was not the tourist attractions that attracted the visitors to the area but suppliers and service providers keen to show off their products to prospective customers. Damien Martin, Managing Director of Assure Services explains: “We provide the most advanced kitchen duct cleaning services available on the market today, all across Northern Ireland. It was therefore the perfect opportunity to meet existing and prospective customers for the Tegras Kitchen Duct Cleaning system. We are able to offer Kitchen Duct Cleaning to a standard that is unrivalled – TR/19 Industry Standard. We provide your restaurant, hotel or business with the most up to date Extraction System Cleaning technology which significantly reduces the downtime on the cleaning of your Duct Work by up to 70%, meaning minimal disruption to your business . Quite simply we make your life easier so that you don’t have to worry. For all your kitchen duct cleaning service needs in Belfast and all the six counties of Antrim, Londonderry, Tyrone, Armagh , Down, Fermanagh or beyond, you have our assurance that Assure Services NI will take care of this to a standard that is unrivalled allowing your business to run smoothly.